Own the entire miniPath collection (all 4 designs) and save $15 over ordering them each individually! Included with each miniPath® in the miniPath collection is a stylus, velour carrying pouch (which doubles as a non-sliding surface on which to rest the miniPath®), and information pamphlet discussing the designs and directions for use. The miniPath collection therefore can be broken up into 4 separate items for gift giving as each miniPath® is a complete product or can be given as one multi-item gift for your labyrinth enthusiast. 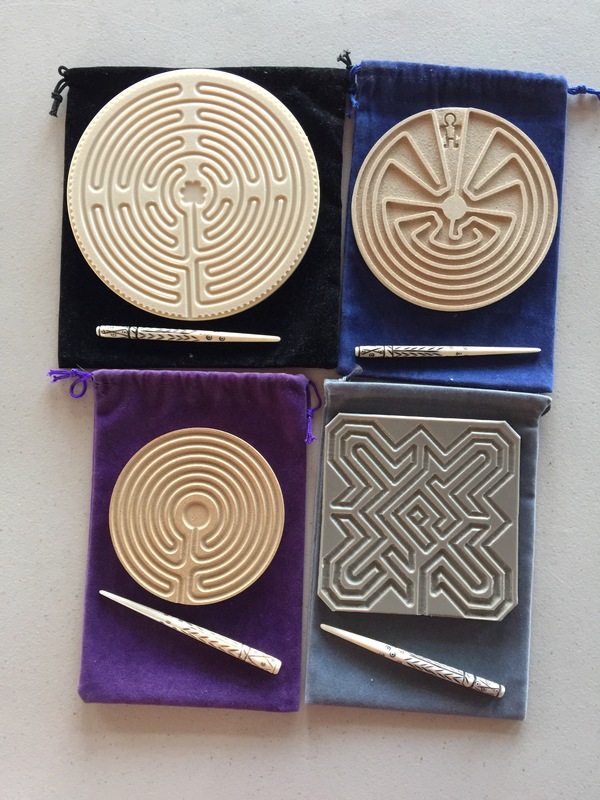 miniPaths® are small, hand-held labyrinths, either inlaid in plain recycled compressed wood (5″ Man in the Maze design) or in plastic (6″ Chartres design, 4″ Cretan design and 4″ Ely design.) These are miniature replicas of our larger wood and plastic finger labyrinths. A miniPath® functions in much the same way as a finger labyrinth, (to further relaxation, meditation & prayer) except you use a stylus rather than a finger to move through the design (the paths are too narrow for a finger to use). They are designed to fit in a pocket, purse, briefcase or sit on a desktop. Whether at home, work, school, in a car, train or airplane, miniPaths® are ready to use anytime for greater relaxation, personal focus and guidance. During the 13th century, this design was inlaid into the floor of Chartres Cathedral in France. It was adopted by the church during the Middle Ages as a substitute for the physical pilgrimage early Christians made to Jerusalem. The 11 circuits & center may represent the 12 apostles. There are 113 teeth known as “lunations” which adorn the outside of the pattern and many believe the ancients used these lunations as a sundial in order to determine the lunar feast of Easter. The center area (rosette) is a six-petaled rose that some believe represents the Virgin Mary or cosmologically, the six kingdoms of existence; mineral, plant, animal, human, angelic, divine. It is thought that by spending time in a petal representing a kingdom that embodies a quality that you are trying to emulate (i.e. the mineral and plant kingdoms teach us patience), you will come to better understand that quality. This labyrinth frequently takes you close to the center and then back towards the outside of the design. This tan plastic Chartres labyrinth pattern can represent coming close to and moving away from your personal, transformative center, a place of intense knowing and change. The Cretan labyrinth design is one of the oldest (4000 years or more), simplest and most widely used labyrinth pattern in the world. It’s name was derived from an early representation on the Isle of Crete. It is also referred to as the Classical 7-Circuit design and can be used as a template for the seven major energy centers of the physical body known as Chakras. Understanding the quality of each of these energy centers as it relates to a specific path or circuit on the design, assists you to consciously gain insight into and ferret out answers to the complexities of life. The pattern looks like the cross section of a human brain and has therefore been used effectively to assist those with Dyslexia, ADHD, neurological disorders etc. This design comes out of the spiritual tradition of the Tohono/O’odham tribe in Southwest Arizona and New Mexico. The figure waiting at the top/entrance to the design, may represent the concept of a child (all of Creation) being birthed by its’ mother (Mother Earth). It may also represent the process of moving inside yourself to get in touch with the creative process and thereby give birth to new ideas. Several non-uniform path widths (wide to narrow from the outermost to the innermost areas) may indicate movement from a heavier, denser, constrictive energetic pattern (our everyday lives), to a lighter, finer, more expansive energetic pattern (the spiritual realm). The design looks somewhat like a dreamcatcher and therefore, may help trap unwanted or negative thoughts and feelings you walked in with. You are then able to leave those thoughts and feelings behind and follow the path back out, feeling more uplifted, lighter and freer in both mind and body.